The Phillies announced on Tuesday afternoon that right-handed starting pitcher Roy Halladay had been placed on the disabled list with a strain of his latissimus dorsi, or in other words- a lat strain. 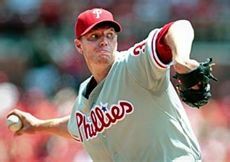 Halladay left his most recent start against the Cardinals on Sunday after just 2 innings of work. The team’s ace is expected to miss 6-8 weeks, while he recovers. Speculation had been running increasingly wild this season, as Halladay’s statistics were not reflective of his typical dominance. In his previous two seasons since joining the Phillies, Halladay, 35, sported a 40-16 record along with a 2.40 ERA in 65 regular season starts. This year, however, the man known as “Doc” had struggled a bit, tallying a 4-5 record with a 3.98 ERA. A positive outlook on this situation is that Halladay does not require surgery. Missing Halladay for less than two months is certainly a much better option for the Phillies than for the two-time Cy Young Award winner to miss the remainder of the season. The news for Halladay came exactly two years to the day after he threw a perfect game against the Florida Marlins in Miami. Cole Hamels (8-1, 2.43 ERA), Cliff Lee (0-2, 2.82 ERA) and Joe Blanton (4-4, 4.55 ERA) remain in the Phillies rotation, along with Kyle Kendrick (1-4, 4.10 ERA), who is already filling in for injured righty Vance Worley. Sidelined since May 12th with right elbow inflammation, Worley is hopeful for a return to action soon. While catcher Erik Kratz has been called up to fill Halladay's void on the roster, for the time being, it is unclear who will take Halladay's spot in the rotation the next time it comes up. With an off day on Thursday, the Phillies could skip his turn and let the other four hurlers throw on the normal four days of rest. Right-hander Tyler Cloyd (recent feature HERE, exclusive interview excerpts HERE) stands out as a likely option, as the 25-year-old has dominated Double-A and Triple-A opposition thus far in 2012. Combined in 10 starts for Reading and Lehigh Valley, the 6-foot-3-inch 195-pounder is sporting a 7-1 record with a 2.01 ERA and a .208 batting average against.